The title is probably one of the longest phrases in the novel, which is a mere 191 pages, including illustrations and generous white space. It is short – in words, phrases, and chapters. Yet, prolific author McMurtry (now 81 years old) manages to make every word count. And in each minimalist sentence every detail stands out like lightning against a black sky. His writing is straightforward, and sometimes brusque and laconic. But even the way he describes a woman being beaten, or Indians torturing a soldier, is in the same economical prose as the way he describes a cattle run or a gunfight. The main character here is historical figure, Wyatt Earp, and his contemporaries, bumming around the eponymous bar in fictional Long Grass, Texas, in about 1880. A great deal has been documented about the lives of Earp and his brothers, and while they were legendary, but they were also just “sometime gamblers, sometime lawmen, middling businessmen, wannabe politicians”. 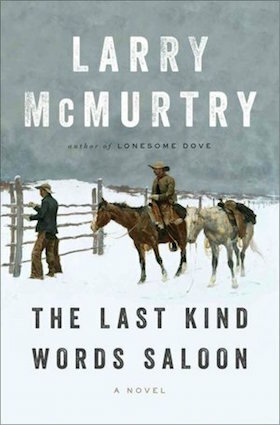 McMurtry depicts the ordinary man and makes him more real than even the historical photos can – as a bad-tempered, grimy, grouchy, dry-witted porch-sitter. There is always the unspoken threat of Earp pulling a gun and shooting someone dead with perfect aim. That it is established fact how the famous “gunfight at the O.K. Corral” turned out, does not detract from a fascinating character study. Frontispiece from The Last Kind Words Saloon. 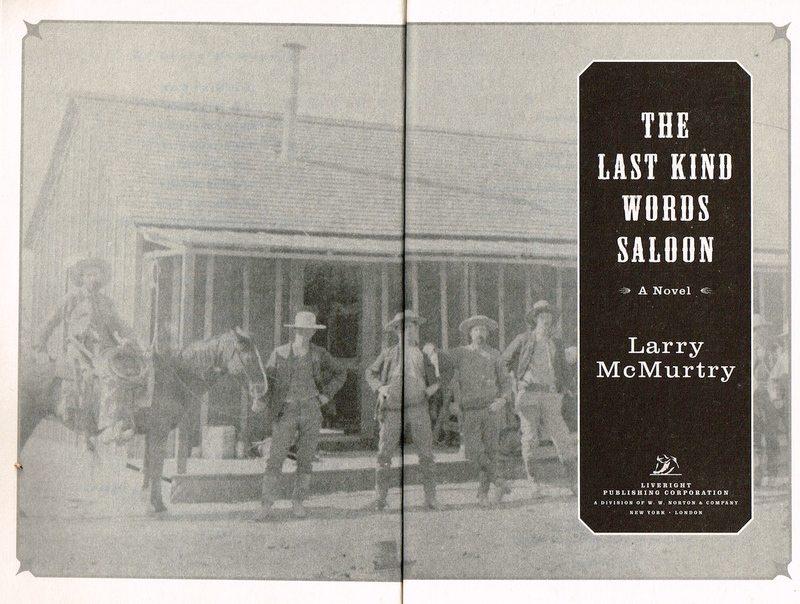 It is not only Earp that McMurtry depicts so clearly that he can almost stride from the pages of the novel, but also his brothers, Morgan and Virgil, his side-kick, Doc Holliday, Earp’s long-suffering common-law wife Jessie (Josephine Sarah), cattle rancher Charles Goodnight, Buffalo Bill Cody, and the British peer who decides to build himself a massive ranch in Arizona. 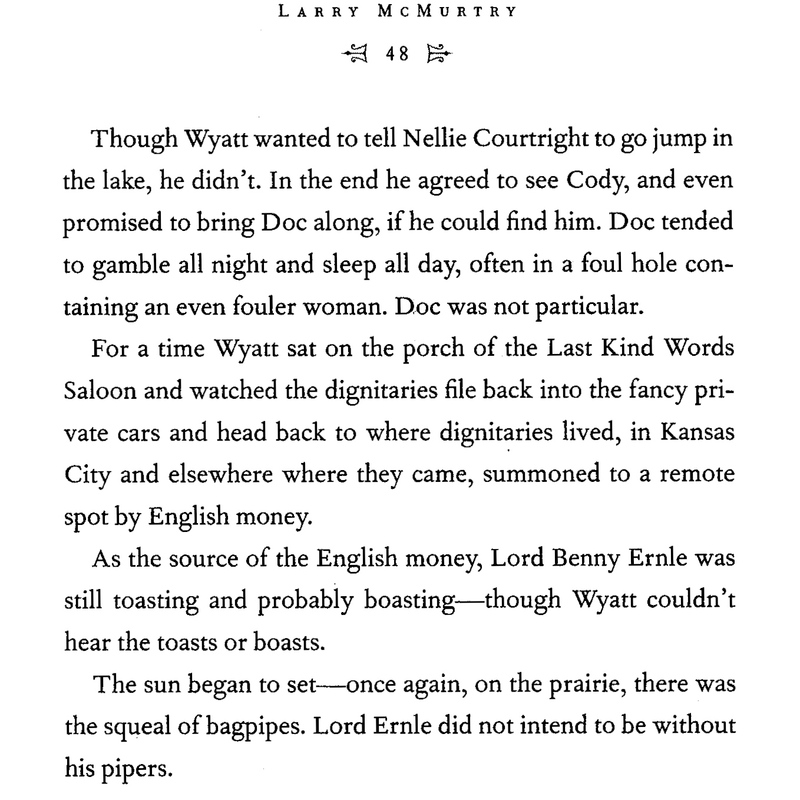 McMurtry based the character of the ridiculously wealthy, concubine-keeping British investor, “Lord Benny Ernle” on the actual Irish financial of Charles Goodnight, stockbroker John George Adair. Ernle is an invention, but the other main characters really existed. Photo of Wyatt Earp, taken circa 1923, about 40 years after the events in this novel. This is from an excellent article about him in Nevada Magazine, The Earp brothers seek their fortunes in Nevada, by Ron Soodalter. The article has interesting historical photos of Earp and his contemporaries. That is the key to understanding and appreciating this book. Earp and company are the legends imagined by McMurtry, a few moments at a time, but more distinctive, more eccentric and daring than the real people could have been – and a great deal less romantic. For one, the fight with the Clancy clan in the “OK Corral” does not make Earp into a better man. He remains as he is: unloveable. “When Wyatt walked in on Jessie she grabbed him and held him tight and kissed him passionately. ‘You fool, you could have been killed,” Jessie said, crying. Note the plays on words and musicality created by the repeats of “foul”, “dignitaries”, “boast” and “pipes”. The novel is indeed, a “ballad in prose” as he writes in the epigraph. There are many sorts of ballads, but all ballads, including this one, have the following features: they are narratives, self-contained, concise, relying on imagery rather than long descriptions, they can be tragic, romantic, historic or comic, and they may contain repetition of some element. If you want an enjoyable recreation of a legend in a prose ballad, read this. It will be a brief enjoyment, but a memorable one. Here is my review of Rhino Ranch, by McMurtry, in which I compare his style with that of Annie Proulx. 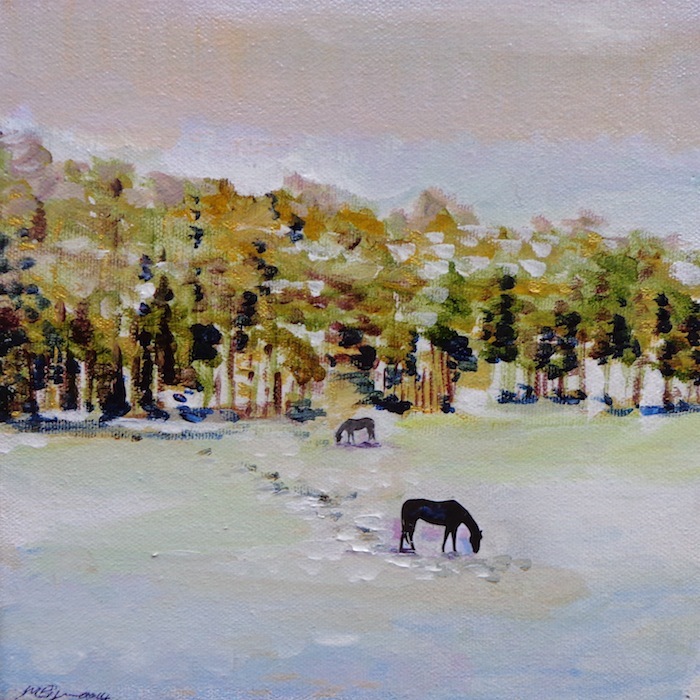 Based on an original painting by M. Bijman, “Snow series – Horses in a snowy field”, Sept 2014.